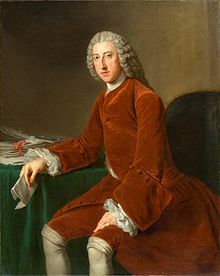 William Pitt, 1st Earl of Chatham (15 November 1708 – 11 May 1778) was a prime minister of Great Britain. He was appointed by King George III. His London house, in St. James's Square, is now the home of the international affairs think tank called Chatham House. In 1758, during the Seven Years' War, he came up with the strategy of blocking the St. Lawrence River so the French troops in Quebec and Montreal could not get more supplies. This weakened the French side, and helped to win the war. His son, William Pitt the Younger, was also a prime minister. This page was last changed on 7 October 2017, at 10:16.